STAT Climate Control Solutions are experts in indoor air quality. A healthy living environment requires healthy, well circulated air. We can install new ventilation equipment, provide furnace humidifier installation as well as dehumidifiers to improve the air quality in your home. Contact us to solve complex ventilation issues to improve your living environment or for furnace humidifier installation. Today’s homes are built to higher energy efficiency standards which improves energy consumption but also poses a challenge for indoor air quality with less fresh outdoor air being able to enter the home. Most home owners consider energy efficiency a priority but miscalculate the importance of healthy indoor air. Well designed ventilation systems are crucial for supplying continuous fresh air, removing airborne infection, regulating air movement or simply to remove excess heat or humidity - better ventilation can make your home more comfortable - and healthier. We can show you a full range of heat recovery systems that recover lost heat energy and control room temperature changes, maintaining a comfortable and clean environment. The system works by replacing the internal stale air with fresh air from outside. 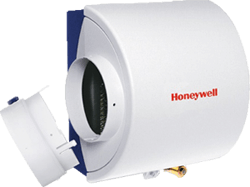 The heating and cooling technology then delivers the fresh air at the desired temperature. Our cold winters in Alberta make the air outside very dry which creates issues inside the home including dry skin, scratchy throats and is detected with electrostatic shock. An HVAC humidifier can add moisture to the air molecules eliminating problems caused by excessively dry air. Cold Alberta air in the wintertime is dry. This issue is Compounded when heating your home to stay warm which also removes moisture when it is heating air from the central HVAC system. The loss of moisture or humidity is exacerbated when dry air removes moisture from your skin and everything else inside the home by way of osmosis. The result: dry irritated sin, static electricity and loss of moisture from woodwork. Additionally excessive dry air can increase allergy and asthma symptoms and can help viruses thrive increasing the likelihood of catching a cold. Stat Climate Control Solutions has whole-house humidifiers that are low in maintenance, compared to conventional room or small humidifiers. Whole-house humidifiers can offer superior humidity control throughout the entire home and use the homes HVAC central air system. A whole-house humidifier is a much better choice for adding humidity as smaller room humidifiers can only add humidity to limited floor space areas and need to refilled often and cleaned regularly to remove mould and bacteria build-up. We can provide you with choices for home humidity and you can enjoy a healthier, more comfortable home.